A handful of Early McIntosh just after a late summer rain. Apple crates as far as the eye can see. Head Cidermaker Seth Boeve chats with a farmer about his apple delivery. We test every crate of apples before we carry it in the cider house. And by test, we mean taste! Cidermaker Courtney Strahan (foreground) and QC Lab & Research Analyst Tara Gillies (background) sample a crate of Goldens. Head Cidermaker Seth peers into a new delivery. Alan Overhiser of Overhiser Orchards in South Haven, MI, has long supplied Virtue Cider. The subtle aroma of fresh apples permeates the air, and it hits you before you see the apples. Apples for cider are wonderfully diverse. It's this variety that lends to the complexity and depth of our ciders. It's officially harvest season at Virtue Farm! We received our first shipments of apples this week from some of our local orchard partners. As direct as you can get, the farmers themselves drive crates of just-picked fruit straight to our cider house. 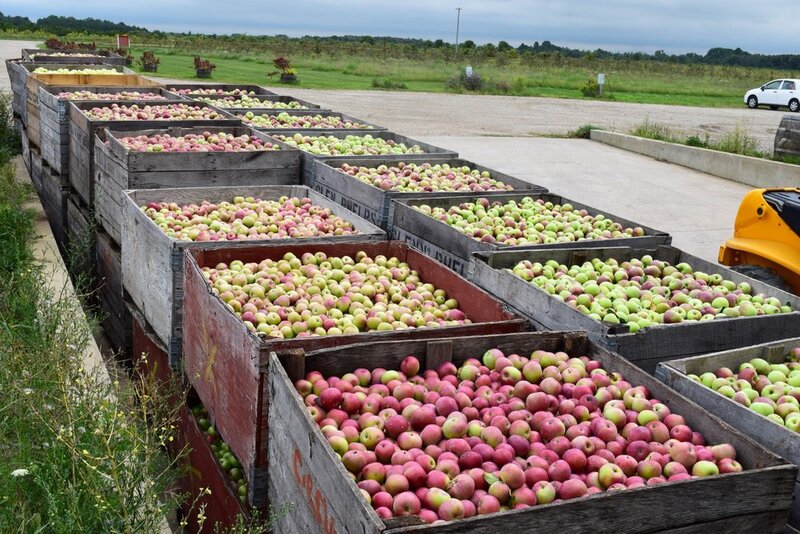 Each crate is bursting with beautifully varied apples in different varieties. 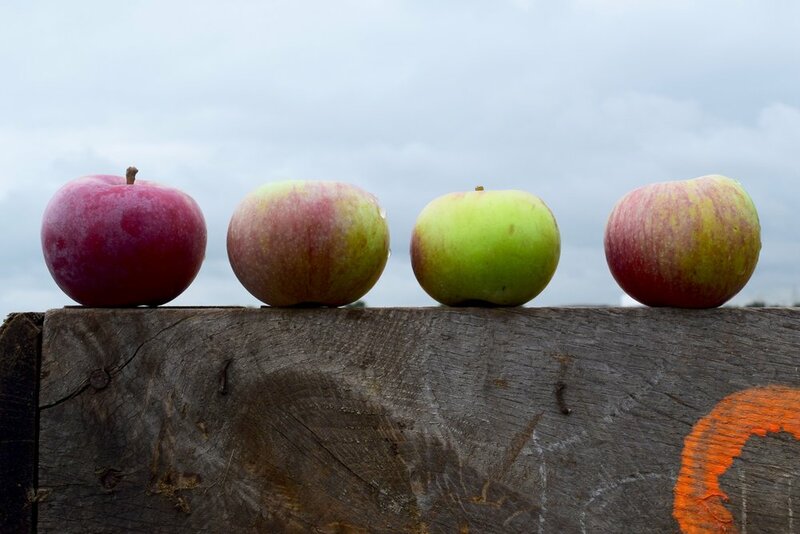 These apples are so different in shape, size, and color; it's this diversity that lends to the depth and complexity of our ciders. We let the apples speak for themselves. Taking advantage of these early harvest jewels, we get right to it. 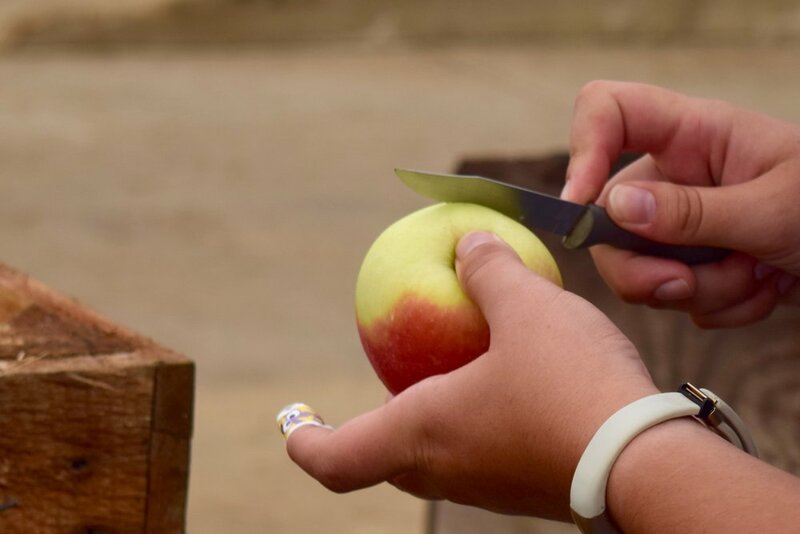 Our cidermakers test the apples for flavor, aroma, and firmness. Then, we load the crates of apples directly to the mill for washing, sorting, grinding, then pressing. Finally, we sock the freshly pressed juice away into fermenters in Cider House 2. It'll be several months before it's finished and ready to blend into a final proper farmhouse cider. 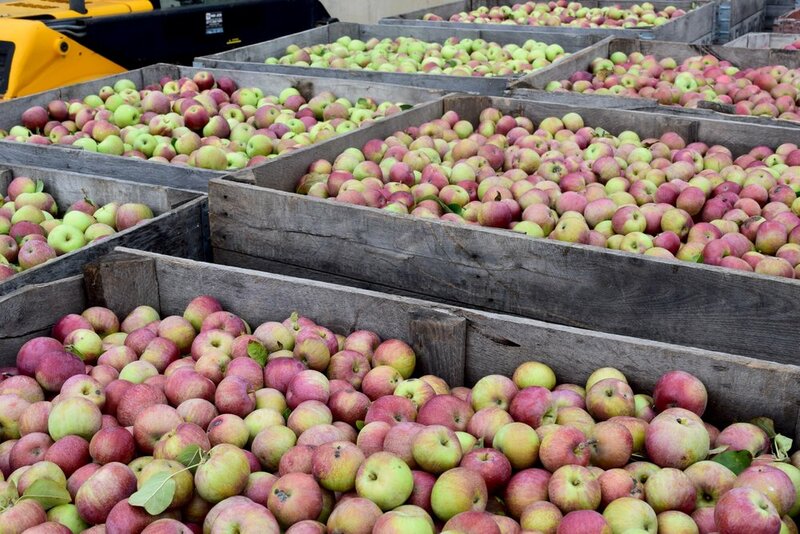 You can help celebrate cider season with us at our Virtue Apple Fest, Sept. 29 to Oct. 2. Read all about it here.